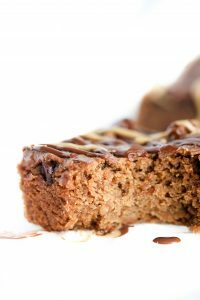 No mixing bowl or spoon required to make these super-easy, vegan, allergy-friendly, buttery, salty, chocolaty bars. Just layer and bake. 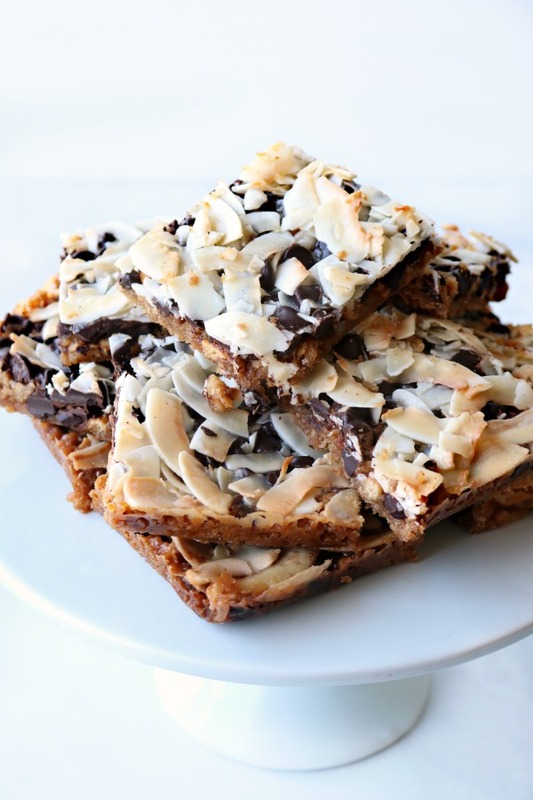 Magic cookie bars. 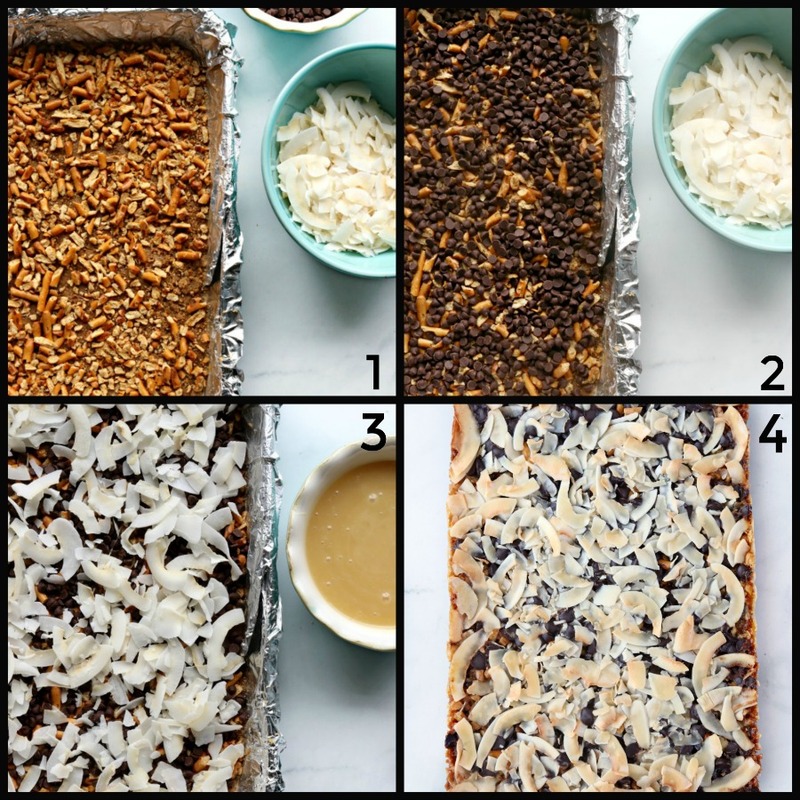 7 Layer Magic Bars, Coconut Dream Bars, Hello Dolly bars…no matter what you call them, they are delicious and so incredibly easy to make. 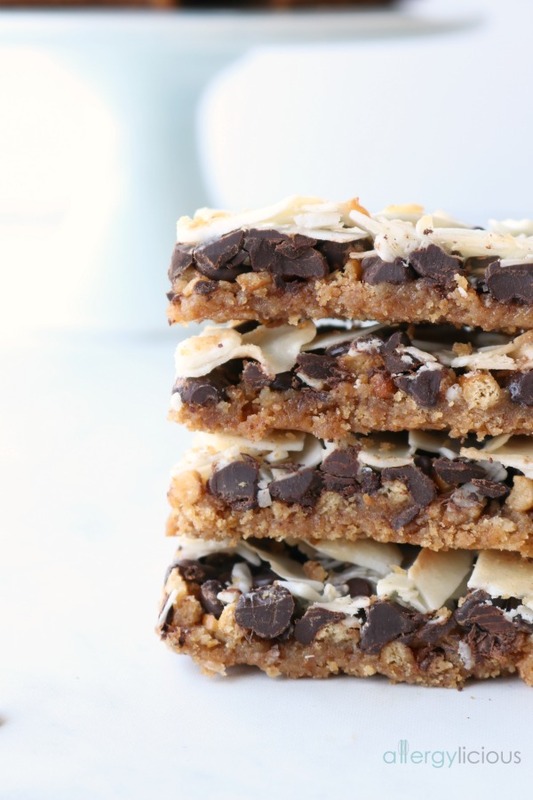 The typical Magic Cookie Bar recipe consists of a crumbly, thin graham cracker crust, topped with lots of super-sweet shredded coconut, sweetened condensed milk, semisweet chocolate and sprinkled with pecan pieces. Every sweet tooth lovers dream! BUT, my “free-from” version starts with a slightly thicker graham cracker cookie base made from gluten-free graham crackers. Our next layer consists of chopped gluten-free pretzels, which takes the place of nuts and balances out the sweetness with a little salty. Vegan chocolate chips (dark chocolate is amazing) come next, topped with unsweetened coconut then drenched in sweetened condensed coconut milk. 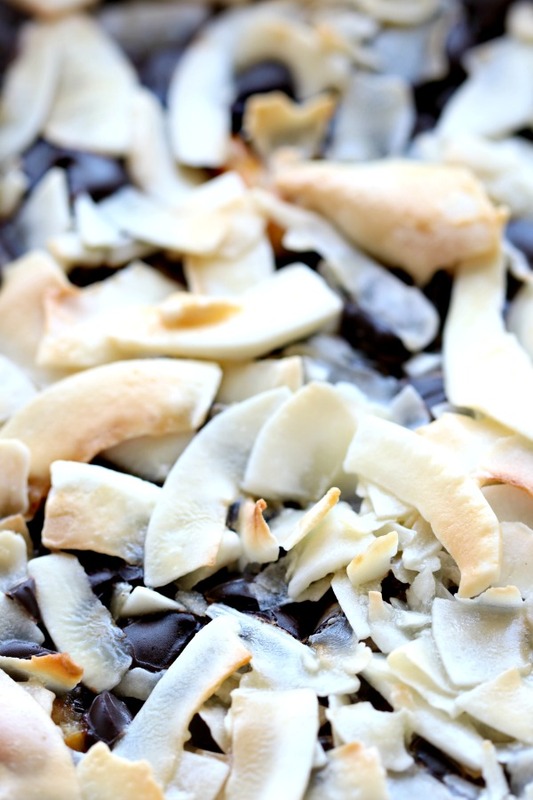 The salty crunch of the pretzels, paired with the slightly bitter chocolate and toasty coconut tame the sweetness of the caramelized condensed coconut milk, making each bite, pleasantly dense, chewy and decadent. It doesn’t seem like something so HEAVENLY could result from layering a few allergy-friendly ingredients in a baking dish. 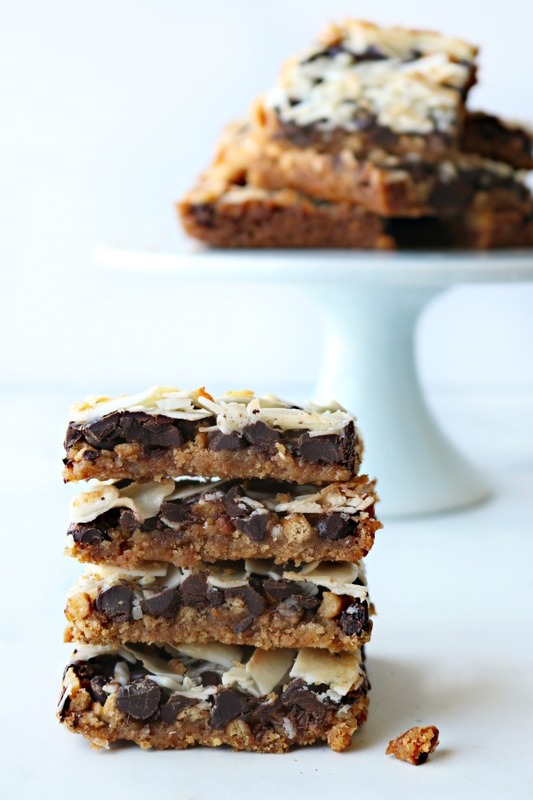 But y’all, these magic cookie bars are simply MAGICAL. Since my whole family loves these delightful magic cookie bars, I find every excuse to whip up a batch of them. Magic cookie bars are perfect to make for holiday celebrations, birthday parties, baby showers, or basically anytime you’re in need of an easy, chocolatey dessert. Buttery, crunchy, salty, sweet and simply out of this world. They may just become favorite celebration dessert!  Check out our fun youtube video below to see just how easy these chewy bars are to make! 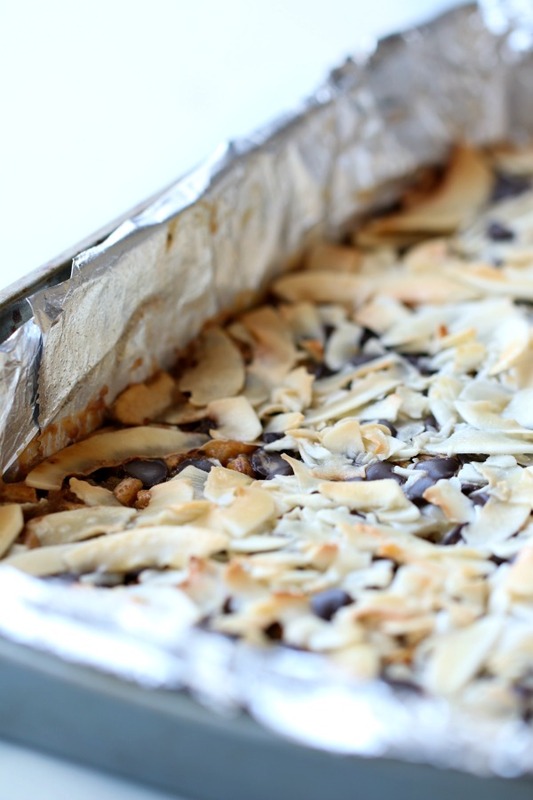 A buttery graham cracker crust is topped layers of chocolate chips, coconut, chopped pretzels, and then finished off with a layer of sweetened condensed coconut milk. Preheat oven to 350°. Lightly spray a 9×13″ baking pan with cooking spray and set aside. Melt butter in a small saucepan or in the microwave (30-40 seconds). Remove from heat and stir in graham cracker crumbs until throughly combined. Press into the bottom of a 9×13 inch baking pan to form the crust. Evenly sprinkle remaining ingredients one by one over the crust to form layers, beginning with the chocolate chips, followed by the coconut flakes, and pretzel bits. Pour the sweetened condensed coconut milk evenly over the top, and spread with a rubber spatula to make sure it’s evenly distributed. 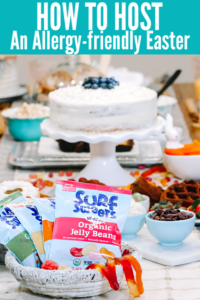 *If you cannot find Sweetened Condensed Coconut Milk and need this recipe to remain dairy-free, blend together 1 1/2 cups of silken soft tofu + 1/4 cup agave and use in its place. 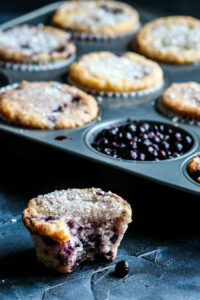 If you give these a try, let know by leaving a comment and rating the recipe! It’s super helpful for us. And while you’re at it, take a picture and tag it #allergylicious on Instagram so I can see your amazing creations all over social media. I think I’m gonna cry happy tears! I thought I would never be able to have Magic Cookie bars again! Thank you for sharing!!! Can’t wait to try it! Happy tears are the best!!!! Hope they bring you a big smile too! Love how easy this looks to pull together. And love even more how delicious it looks! These truly are magical! GREAT recipe!